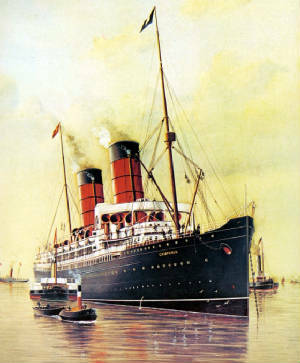 The Campania was constructed in 1893 as a passenger liner for Cunard’s Liverpool to New York service. She began her career as a fast ship, capturing and holding the Blue Riband, a mark of being the fastest passenger liner on the North Atlantic, for the first year of operations. The ship was large for her day, measuring 622 feet from stem to stern. Her triple-expansion reciprocating engines and twin screws produced a general speed of 22 knots. She had the capacity to carry up to 2,000 passengers. The Campania was not a good-luck ship. In July, 1900 she collided with and sank the barque Embleton with the loss of 11 lives. Then in 1904 a rogue wave swept five steerage passengers overboard, marking the first time in history that the Cunard Line lost passengers because of an accident at sea. When the war broke out in 1914, the Campania was among a large fleet of liners taken over by the Royal Navy. But because of her length and speed, she was chosen for more than service as a troop carrier. This ship was converted to serve as an aircraft carrier. She was the first Royal Navy ship to launch aircraft while underway at sea. As part of her refit, the Campania’s forward funnel was removed and replaced by two smaller smoke pipes. A 160-foot wooden flight deck was added at the bow, making her capable of carrying ten Sopwith fighters. Thus she was not a formidable carrier, as was to join the naval vessels of the sea in later years, but an aircraft carrier none-the-less. The Campania avoided enemy attacks throughout the war but she did not survive the war. On November 5, 1918, just four days before the war ended, the ship dragged her anchors under a heavy gale while moored in the Firth of Forth. She collided with the nearby battleship Revenge, tore a hole in her hull, and sank. The wreck still lies at that same spot, and is a favorite attraction for sport divers. It is protected there as a national historic site.